Two Ministers nominated for appointment by the President yesterday came under intense fire from two leading Minority members of the Vetting Committee, who drilled them with tough questions which sent one into a state of timidity whilst the other was rendered speechless. Jake Obetsebi-Lamptey The most visible nominee was the re-nominated Minister for Tourism and Modernization of the Capital City who was almost ridiculed for his blank academic credentials, and controversies surrounding the involvement of companies affiliated to him in the execution of certain government projects. “I do make no claims to school certificates” are words of the Minister-designate for Tourism and the Modernization of the Capital City, Jake Obetsebi Lamptey, when he was questioned by the appointments committee on the status of his certificates, which were not reflected on his CV. He said while he makes no claims to certificates because he did not posses one that he could boast about, he did gain two things in education. One is he learnt to learn and the other is he gained enough at school to get his first job. “I have never been unemployed.” The nominee explained that even though he disappointed his father by not bringing back home the law degree, at least 14 years since he left school, it has been enough compensation to him. 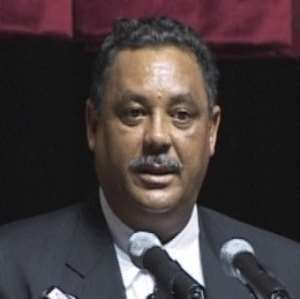 The Tourism Minister, Jake Obetsebi Lamptey, also answered questions on his flirtation with the Church of Jesus of the Latter Day Saint (Mormons) and the controversial circumstances under which he and his wife traveled on the church's ticket to Utah. The Minister was invited by the Church soon after the NPP came to power and plane tickets as well as deluxe accommodation were provided and paid for by the church. But the Mormons who invited the Minister told The Chronicle last year that, they invited the Minister to Utah to attend the church's annual conference on international law and also to learn about the church. Jake told the Vetting Committee yesterday that his trip was official even though the Office of the President had told The Chronicle last year that his trip was private and that the President was not the one who sent him. Last year, when the story about Jake and his Mormon scandal broke, the Mormons told The Chronicle that Mr. Obetsebi Lamptey paid for his own plane tickets, but Jake himself admitted in an interview with The Chronicle that the Mormons paid for the tickets for him and his wife. On that so called official trip, Jake, who was then Chief of Staff at the Office of the President, took along his daughter who was then attending Pennsylvania University in the US. The Minister followed his daughter to the admission office of Brigham Young University which is owned and operated by the same church which invited him to seek for admission. Even though the Minister asked for scholarships from the Mormons, he explained to the Vetting Committee that none of the scholarships went to his child. Interestingly, at the time the Church was showering all these invitations on the Minister, they were lobbying their way to acquire a permit to construct their building in Accra. They had pursued that permit for close to 20 years without success during the NDC government. HACKMAN OWUSU AGYEMAN Hon. Hackman Owusu Agyeman was the next nominee who went through the sharp grill of the Minority Leaders, nudging into the affairs of a company called Sikelele which was started by the Minister several years before he became a member of parliament. At the end of it all, even the Chairman admitted that his vetting had taken long and explained to him that the exercise was part of the vetting procedure. The Minority Leader who is also a ranking member of the vetting committee suggested that Sikelele had been involved in executing certain government projects such as the rehabilitation of government buildings and wondered whether if confirmed as Minister for Works and Housing, he wouldn't face conflict of interest situations. The Minister said that for a long time he has had no relation with that company and made a forceful point that his family had to survive so if they submitted a bid for any government contract, they would be subjected to the same procedure that other competitors would be expected to go through. The Minister suggested that it would be unfair for his family to “go hungry” because he was serving as a government official. The Minister explained also that when he became a Member of Parliament, he had permission to work with the said company but since he became a Minister of State, he had severed all relationships with the company to the extent that he did not know what contract or job they were doing. S. K. Boafo The minister designate for the Ashanti region, S.K Boafo said that as far as his vision was concerned, Kumasi had to see to the movement of traffic and ensure that it became faster than what it is now.